Install Diablo II and the Diablo II: LOD expansion. Download and install the patch for the expansion. I found it on Blizzard's site, here. Direct link to the patch. Get the program to run in Vista.. Right click the "Diablo II.exe" executable, click properties and then go into the "Compatibility" tab. Play the settings you see here until it works. What worked for me: "Run in compatibilty mode for XP SP2", "Run in 256 Colors" and "Run in 640x480 screen Resolution" all checked. Another popular solution to Vista woes: anytime you run the executable, right click and then "Run as Administrator". Good luck. 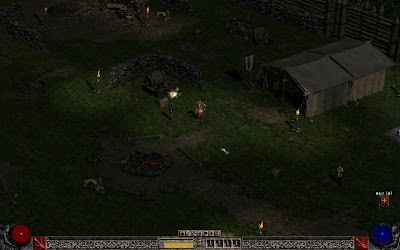 On first run Diablo II may do a "Video test" and allow you to select which graphics driver to use. I was unable to run the game using the Direct Draw driver, but the Direct 3D driver works. You can change this setting later by running the "D2VidTst.exe" executable in the install directory (you can also find it in the start menu). Download the D2MultiRes mod. Direct link. Unzip the downloaded file and copy its contents to your Diablo II directory. Run the game from "D2MultiResGame.exe". You will probably have to go through the same process as above to get it to play nice with Vista (compatability mode settings). The mod creator claims that it is incompatible with the Direct 3D driver but I didn't have any problem. The main menu screen will still be at 640x480 but once you start the game you will have a myriad of resolution options! I mentioned running at 1440x900 but at that resolution it was difficult to click enemies (which you do a lot of in Diablo..). After bumping it down to 1280x800 many of those difficulties went away and the game still looks great. One thing I'm suprised with at high res is the "Perspective" graphics. It's Blizzard's way of making a 2D game look much more 3D and it is gorgeous to see in action at high resolution. Basically, as you move your perspective of the landscape shifts as well. So a wall will subtly rotate or change size as you move away from it to provide the illusion that it is actually a 3D object. I've never noticed it before at lower resolutions but at 1440x900 it really pops out when you are just walking around town. Unfortunately a screenshot can't really capture the effect, install the game and see for yourself! I've tried downloading this mod from multiple sources. After following the instructions, when I run the .exe file (in different compatabilities etc. ), the same error comes up stating that the .dll file could not be accessed. Any help? I'm running in vista. I've got the same problem; it seems that's just an D2MultiRes incompatibility issue, it somehow hates LoD. Try playing `pure` Diablo II.